My meeting took many weeks and some string-pulling to arrange. It is not an interview, as such, insists Father Nephon, a Patriarchal archimandrite, or senior abbot, but an ‘audience’. I feel slightly daunted. Both the Dalai Lama and the Pope are known as ‘His Holiness’, but Bartholomew I, 270th Ecumenical Patriarch of Constantinople and spiritual leader of some 300 million Eastern Orthodox Christians worldwide, is ‘His All-Holiness’. There are other ancient Patriarchs in the Eastern Church, in Jerusalem, Antioch and Alexandria, but he is ‘first among equals’. I’m following in the footsteps of George Bowen, my great-grandfather, who visited the Ecumenical Patriarch in 1848 while researching the first guidebook to modern Greece. Bowen, a Hellenophile but also an admirer of the Ottoman pashas, wondered if the time would come when Greece would reclaim its former capital at Constantinople — something that then seemed a possibility. However, history has dictated otherwise, and after decades of what Turkey’s dwindling ethnic Greek minority describes as sustained persecution, the Patriarchate in Istanbul — the holiest centre of the Eastern Orthodox Church — is today in danger of extinction. The Patriarchate shelters within a walled enclave in the traditionally Greek district of Fener, north-west of the historic centre of old Constantinople. In Bowen’s day, Fener was home to Greeks who amassed fortunes working for the sultans and in banking and trade. Then, this cosmopolitan Ottoman city — straddling the two continents of Europe and Asia — was noisy with Turkish, Greek, Ladino, Armenian, Arabic and a variety of Levantine voices, while churches co-existed alongside synagogues and mosques. Now, however, Turkey’s orientation is shifting eastward, and nationalism, a potent but largely secular force that drove modernisation in Turkey for more than a century, is taking a decidedly Islamist turn. Tolerance is narrowing. Greeks, departing in huge numbers, have abandoned entire streets of Fener to Anatolian squatters, leaving the Partiarchate a beleaguered Christian island. Not that its high stone walls guarantee protection: in 1997 a grenade was hurled into the citadel and a deacon lost his arm. On the entrance steps of the Patriarchate, young men in identical black suits talk into mobile phones. I assume they are security guards but discover they are monks, disguised in mufti because the secular Turkish state prohibits all but the Patriarch from wearing religious garb outside church property. I enter the Patriarchate by a side door, the main gate having been locked since the Greek War of Independence broke out in 1821; the Turks dragged Patriarch Gregorius V from the Easter service and hanged him from it. I wonder if such inherited memories make it difficult for the two communities to live together, or if the very survival of the Patriarchate, now some 1,700 years old, is, rather, an example of how Christianity can co-exist with Islam. Nikos, an ernest-looking young cleric with close-cropped hair, is my appointed guide. Meeting me in the small courtyard lined with Ottoman-style clapboard offices, he offers to show me round the Italianate church of St George. Stone, incense, chandeliers: it takes a moment for my eyes to adjust and take in the gilded baroque iconostasis — a screen of icons. St George’s is modest compared with the former Patriarchate church of Hagia Sophia, the golden pride of Byzantium until the conquering Ottomans converted it into a mosque in 1453. We pause to admire two glass and marble caskets containing the fourth-century bones of two of the Church’s founding fathers, St John Chrysostom and St Gregory the Theologian. Nikos also points out a precious portion of Christ’s whipping post, and the coffined remains of St Theophano, which he claims secrete myrrh. ‘I’ve seen it for myself,’ he says, with an adamant flourish. I check my watch. ‘Don’t worry,’ Nikos says, ‘we’ll be on time’. He hurries us across the courtyard and up the crimson-carpeted marble stairs of the Patriarch’s House to the third floor, where the Hall of the Throne, the Hall of the Patriarchs, and the Holy Synod Room are located. Then we slip along hushed carpeted corridors to wait in a lobby on a row of green velvet chairs. Lay functionaries in black suits go back and forth on important-seeming business. The walls are hung with prints of old Istanbul, not that I make the mistake of saying the word ‘Istanbul’, here of all places. For this is the tiny but still beating heart of Constantinople, New Rome, capital of Byzantium and — until the Turkish conquest — cradle for a millennium of the Eastern Orthodox Church. It was in this city that much of the orthodox Christian liturgy was devised, and that church councils were held to define exactly what it all meant. And it was from Asia Minor (which includes modern Turkey) that much of the New Testament originated. In 1848, my great-grandfather described the Patriarch’s office as painted with flowers and birds, ‘like a second-rate Italian Inn’. Today, it’s like stepping into a box of Christmas decorations. There are panelled walls and a wooden ceiling hung with a crystal chandelier. The room is cluttered with ornate faux-Louis XV occasional tables covered in glass dishes containing shiny baubles and framed photographs of the Patriarch shaking hands with dignitaries — including President Barack Obama. The walls are lined with gilt-legged chairs, upholstered in scarlet brocade. It is not hard to see what he means. The historic hostility between Greece and Turkey, played out in microcosm in Constantinople, is legendary, and the Patriarchate has long been caught between the two, most recently over the Cyprus conflict. According to Hürriyet, Turkey’s leading daily newspaper, some Turks, among them Nurşen Mazıcı, Marmara University’s influential history professor, still suspect the Patriarchate of being a nest of spies with a secret weapons cache, who continue to espouse the Megali Idea — the Great Idea to reclaim all former Hellenic lands for Greece, with Constantinople as its capital. ‘We have suffered lots of tormenting by the government and extremists,’ Bartholomew I says. He has been jeered, spat upon, had his windows smashed. Orthodox cemeteries have been desecrated. 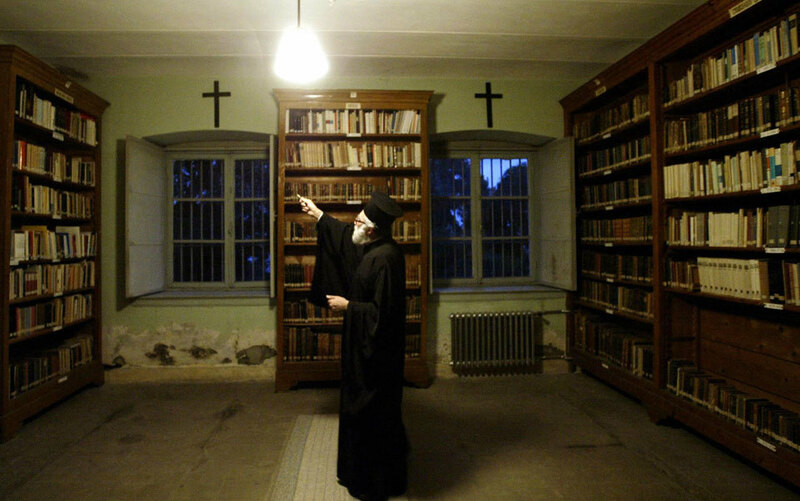 Thousands of buildings belonging to the Greek Orthodox community, including schools and hospitals, have been confiscated, and most destroyed or sold. I am surprised by his candour, given how the government scrutinises his every word, but mostly he has to be circumspect. For example, he does not mention the 2012 report by the US Commission on International Religious Freedom (USCIRF), which lists Turkey as one of the world’s worst violators. This is wise. In a loose interpretation of anti-terrorist laws, directed nominally against the Kurds, government critics are increasingly being silenced. The Committee to Protect Journalists, an independent non-profit organisation, reports that there are currently 76 Turkish journalists in gaol, more than anywhere in the world — almost twice the number in Iran, and three times the number in China. Another difficulty Bartholomew faces that while the Ecumenical Patriarchate is the supra-national centre of the entire Orthodox world, the Turkish state does not recognise this in any formal sense, only acknowledging Bartholomew I as leader of the tiny ethnic Greek minority, known as the Rum, in Turkey itself. This community has dwindled since the 1923 population exchanges that accompanied the collapse of the Ottoman Empire, and under various pressures generated by the Cyprus conflict – including government-inspired riots in 1955 – and the mass emigrations during the politically unstable 1980s and ’90s. Since 1912, Turkey’s Rum population has plummeted from 1.8 million to 2,500. Only 250 children remain in Rum minority schools today. If the trend continues, Bartholomew I is in danger of becoming a shepherd without a domestic flock. Meanwhile, the loyal Orthodox diaspora views the See of Constantinople as the ancient repository of its collective faith, but if there are not enough Turkish-born clergy from which to choose a future Patriarch, they are in danger of losing that repository. The Patriarchate itself could become a relic — as venerated but ultimately lifeless as a casket of Byzantine bones. From 1923 on, Turkey has officially been a secular republic, and religion in public life was, accordingly, zealously suppressed. At the same time, forced population exchanges meant that the national population became overwhelmingly Muslim and ethnically Turkish. Today, there are mixed messages everywhere. The state maintains its official veneration of Mustafa Kemal Atatürk, the secular republic’s founding father, whose portrait, by law, is still displayed in every public building and institution. And the lure of the West endures: Western goods are eagerly snapped up by a youthful population riding an economic boom. Turkey’s desire to join the EU is not yet dead, and is supported by Bartholomew I as a way of diffusing racism and stabilising Turkey’s institutions, including the Patriarchate. At a governmental level, too, Greek and Turkish relations have thawed somewhat, despite ongoing tension over Cyprus. The Greek government has been a crucial supporter of Turkey’s EU bid. On the other hand, there has been a popular revival of religious observance, prompted both by nationalism and a desire to fill a spiritual void. At street level, the litmus test is the headscarf, worn by increasing numbers of articulate professional women, including the wives of both Turkey’s president, Abdullah Gül, and its prime minister, Recep Tayyip Erdoğan. The hijab remains illegal for civil servants, and although the government’s recent attempt to legalise its adoption in state universities was overturned by the courts, women are ignoring the ban in rising numbers. Despite a government that wishes to be seen as reformist by the EU, some Islamists are growing more extreme. The Turkish pianist Fazil Say, for example, is currently awaiting trial for reportedly insulting Islam on Twitter; he could be imprisoned for 18 months. This push-me pull-you between secular and Islamic, military and civilian, West and East, is being played out at the highest level, with the pro-Islamic civilians of the ruling Justice and Development Party — the AKP — currently on top. The secularist military old guard, 325 of whom were gaoled in September 2012 for alleged anti-government conspiracies, looks outdated next to the youthful thrusts of the so-called ‘Islamic Calvinists’, many of them businessmen turning away from the West to find fresh markets in the East. A university professor, who wished to remain anonymous for fear of the security service, described it to me as a ‘bloodless revolution’. But interestingly, Bartholomew I insists that things have improved recently. In 2010, he won a landmark ruling from the European Court of Human Rights to regain the vast 19th-century church-run orphanage on the island of Prinkipos (Turkish Büyükada) near Istanbul, which was confiscated in 1997. Bartholomew I had also received promising news about the seminary on the neighbouring island of Halki. In March 2012, President Obama (presumably with an eye on Greek-American votes back home) made Halki an international human rights issue by raising it with Prime Minister Erdoğan, and Erdoğan — keen to keep on good terms with the US and Greece — said he saw no reason why the seminary shouldn’t re-open. Two days before my audience, I took the 90-minute ferry ride across the Sea of Marmara, and found the hill-top seminary in a flurry of redecoration for its anticipated re-birth. Inside a red-carpeted chamber with portraits of Metropolitans on panelled walls, a group of ancient bearded monks were drinking tea, like wizards. I tiptoed away, but there was a shout, and a young Greek priest robed in black, hair knotted in a ponytail, introduced himself as Father Samuel. He offered to show me round. In the deserted classrooms there stood rows of black-painted desks and old-fashioned blackboards, unused for more than 40 years. ‘Halki will re-open any day now,’ he assured me confidently. His optimism, like Bartholomew’s, may prove premature. Some secularists warn that permitting a private religious college could pave the way for hate-preaching radical Muslim madrasas, while other people ask why Greeks in Turkey should have a theological college when Athens doesn’t even have an official mosque — the only European capital without one. For now, Halki remains closed. At the Patriarchate, the door opens and a secretary heads towards me bearing a tray with a glass and a long-handled spoon. It looks worryingly medicinal. Sitting in water is a sweet chewy ball of vanilla-flavoured ‘mastic’. I am touched by the courtesy, but also struck by the unintended symbolism: in Greece, this natural resin is called the ‘tears of Chios’, after the island where it is traditionally produced, and where, in 1822, the Turks slaughtered thousands of Greeks, a massacre that has been immortalised by Delacroix. Memories are long here, but Bartholomew I cannot count on Greece’s continuing financial help. A former Greek Consul-General in Istanbul told me that, in his opinion, supporting the Rum and the Patriarch has forced Greece to make too many compromises, such as allowing 100,000 Turks to remain in Greece after the 1923 population exchanges, and not retaliating more vigorously over the Turkish invasion of Cyprus. With most Rum having left Turkey, he considered the Patriarchy an unnecessary and — given Greece’s deepening economic crisis — expensive obstruction. Rather than becoming a holy martyr to the split between Europe and Asia, Bartholomew I is trying to straddle the faultline. In this way the Patriarchate might flourish. Not such a relic after all, perhaps.